Just like the vending carts seen on busy, big-city street corners. Use as a classic way to serve up delicious hot dogs at pool parties, barbecues and other special gatherings. 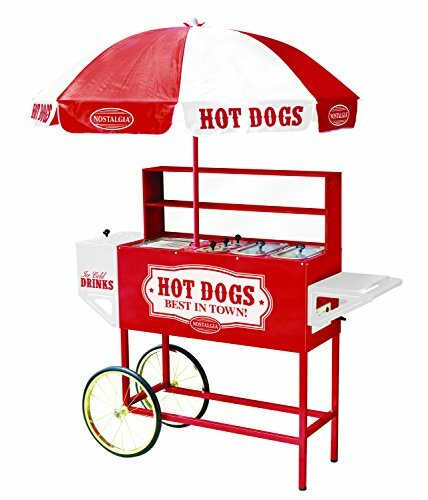 This durable, enameled-steel cart cooks up to 8 hot dogs on the heated cooking rollers and holds up to three packages of hot dogs in each enclosed steamer. Five separate, covered compartments hold buns and condiments and keeps hot dogs warm. An insulated beverage cooler is perfect for keeping canned or bottled drinks ice cold. A unique, colorful and useful novelty item that's one of a kind!